Periacetabular osteotomy is the surgical procedure indicated in hip dysplasia and it involves cutting the bone around the acetabulum so as to fit the head of the femur bone into acetabular socket. This method was developed and performed by Professor Reinhold Ganz and therefore it is also called as Ganz osteotomy. Ganz osteotomy is performed in children, adolescents and young adults in whom growth plate around the hip socket has been closed. The technique involves exposure of the pelvic bone through smaller incisions. A skin incision is made and the underlying subcutaneous fat and muscles are retracted to expose the ilium. In Ganz osteotomy, five bone cuts are made in the pelvic bone around the socket. 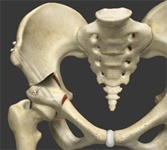 Then the pelvic bone along with the hip socket is rotated into a more stable, horizontal position of coverage on top of the femoral head so as to cover the femoral head in an adequate manner. Once the position is corrected, it is maintained with the help of 2 to 3 small cortical screws.